Willowchester Cathedral was the loveliest Cathedral in England. It had tall spires and fancy carved pillars and dozens of stained glass windows. 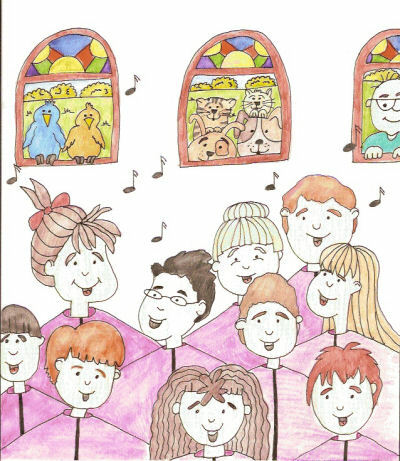 Every year all the children in England got together for a competition to see which cathedral had the best Children's Choir. This year the competition was being held at Willowchester Cathedral. At least a hundred different choirs would be participating this year. They'd practiced daily and all were anxious. 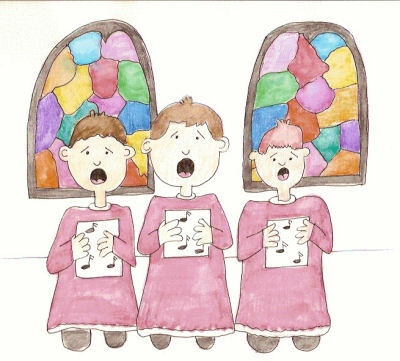 Darrock was a member of the Summerham Cathedral Choir. He'd worked extra hard at his singing lessons and never missed a day of practice. When their choirmaster handed him his purple robe, Darrock slipped it on over his head. All the others in his choir did too. They stood together and practiced. A week before the comptetion Darrock woke up with a sore throat. "Oh no!" He tried to sing but all that came out were squeaks and groans. "Oh no!" He rinsed his mouth with salt water and made sure he drank a lot of juice. Every day when he went to choir practice, his choirmaster made him sit out because he sounded horrible with his sore throat. Darrock didn't know what to do. He'd worked too hard for this and didn't want to miss the competition at Willowchester Cathedral. The day before the competition, a program came in the post. There were choirs coming from Grantbury, Avrilford, Maltham and Oakpool Cathedrals. There were many others, but those were the ones Darrock knew of. On the day of the competition, Darrock went to the bus. His choirmaster told him he could come, even if he couldn't sing. Darrock hadn't tried to sing at all for a week because he didn't want to strain his voice. The drive down to Willowchester Cathedral was fun. The kids looked out the window and saw old Norman churches, hedgerows, sheep, cows and villages dotting the rolling green hills. At last they arrived. The Summerham Cathedral Choir sat patiently listening to the other choirs. One choir from Chartsmouth only had three boys in their choir. They did a grand job though, or at least Darrock thought so. Finally it was Summerham's turn. They stood under some stained glass windows. Darrock joined the group. His choirmaster told him if he couldn't sing, just to pretend. They group stood next to each other, all wearing purple robes. Darrock stood in the middle. His black hair shone by the light coming through the windows. The choir started singing. Darrock opened his mouth and beautiful notes came flowing out. He was so happy that he sang loud and clear. Birds flew by and stopped to hear the choir. Cats and dogs ran up to the windows to see who was singing such lovely music. When they finished they received a standing ovation and loud applause. Summerham Cathedral Choir won first place. The choirmaster was so proud of his choir. He took Darrock aside and told him it was because of him that they won because his voice was so beautiful. Darrock wanted to shout for joy, but didn't. He wanted to take care of his voice so that next year they could come back to the competition and win again.